1650Top priced at $385 with up to 1" (24mm) high stencils and logo option. 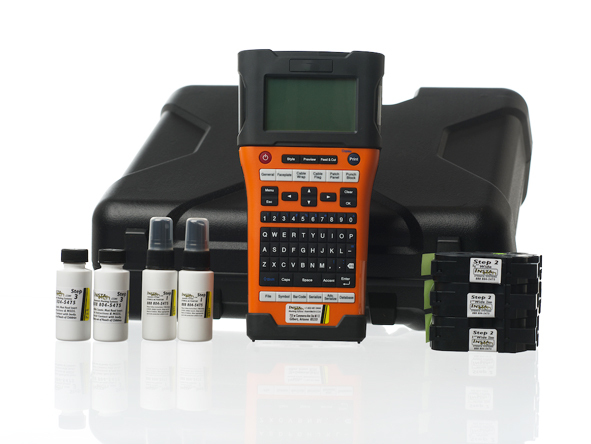 (1) Print1650 - Handheld mobile stencil printer w/ logo & database download capability. (1) Print1650batt - 1650 system rechargeable battery. (1) Print1650wall - 120V U.S. wall outlet battery charger. (1) Print1650ui - stencil logo and VIN database download software. (2) Etch30spray - Step #1 etch stencil activator. (2) Etch15st - 1" (24mm) high Step #2 Stencil Cartridges each 10 (305cm) feet in length. Each enough for 40 longer (1" high x 3" long) stencils or 80+ shorter (1" high x 1.5" long) stencils. (1) Etch14st - 3/4" (19mm) high Step #2 Stencil Cartridge each 10 (305cm) feet in length. Each enough for 40 longer (3/4" high x 3" long) stencils or 40+ shorter (3/4" high x 1.5" long) stencils. (2) Etch30cc - Step #3 glass etch marking gel. (1) Form50cust - 50 pack two-part carbonless insurance discount requests. You may also ORDER MORE SUPPLY in addition to the inclusive 120+ marks included with this system. START A BUSINESS: provide etching for anti-theft OR provide this value added service to your existing business model! GLASS SHOPS: Bill Lynx & Safelite claims for pre-existing etches or add ANSI info to your custom work. DEALERSHIPS: add VIN stencil printing to existing anti-theft program or even brand vehicles with your logo and phone #. MUNICIPALITIES: use as a proven passive anti-theft device to thwart car theft! INSURANCE COMPANIES, BODY SHOPS and SERVICE COMPANIES!